← What’s cooler than 500 rows in Xcelsius? 50,000 rows in Xcelsius! The new BusinessObjects 4.0 platform runs on 64bit OS. In an oracle based environment, this can be the source of much confusion. While the platform itself (the CMS and Audit databases connections) support 64bit oracle driver connectivity, other BO tools do not. For example, the client tools, Universe designer or Crystal Reports 2011 are 32bit applications and will work only with 32bit versions of the oracle driver. So, what is one to do? Well, if you are looking to have the client tools installed on a server (in a development environment for example), or are deploying crystal reports that leverage oracle 32bit client connectivity, you will need to install both the 64bit and 32bit version of the driver on the machine, and in the same home. Once you get both clients installed and configured, you will be able to use applications that need 32bit middleware as well as applications that requires 64bit middleware. In the example above, the 64bit client is installed into the dbhome_1 directory and the 32bit driver is installed in the client_32bit directory. Both are part of the same oracle home. To keep things simple, make sure both clients share the same oracle home, as shown in the picture below, and make sure the tnsname.ora file is configured properly on both clients. To test your configuration, make sure you execute the tnsping.exe and/or sqlplus.exe commands from each directory separately to assure both clients are working properly and can connect to your database. This entry was posted in BusinessObjects 4.0 and tagged Business Objects 4.0 Oracle connectivity, BusinessObjects 4.0 oracle 32bit, BusinessObjects 4.0 oracle 64bit, Crystal Reports 2011 Oracle connectivity, Crystal Reports with oracle in BusinessObjects 4.0. Bookmark the permalink. you are referring to an oracle home when you mean to say oracle BASE. But in fact, you should never place a 32-bit oracle home in the same oracle base as a 64-bit oracle home (the base being c:\app in your example) because if you ever have to deinstall either of them then the entire base is removed (if there are no other oracle homes in that inventory). The 32-bit and 64-bit have separate inventories and the deinstall utility will remove the oracle base if there are no other homes (…client_1 or dbhome_1) in that base. Please be careful to correct what you have posted here. 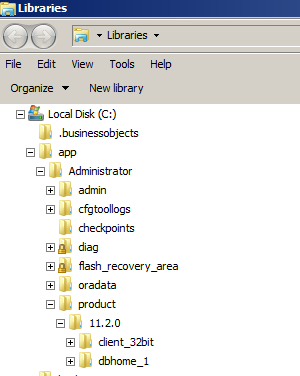 Tina, this post is about a very specific issue related to BusinessObjects and Oracle integration. In my experience this installation methodology worked great! I am not sure under what circumstances you would want to uninstall either the 32 or 64 bit version of Oracle in the situation described in the post, in fact that would negate the need for this work around all together if you could use only one of them. If you have experience with BO 4.x and Oracle integration you can share with the community, i’m sure folks would appreciate it. Thanks. I have a question on this. Same way I have installed both 32 bit and 64 bit in my system. Hi, I followed these steps as you suggested because I’m using BODS DS 4.1 which uses a 64bit client on my 64bit laptop, but also 32bit Information Design Tool. 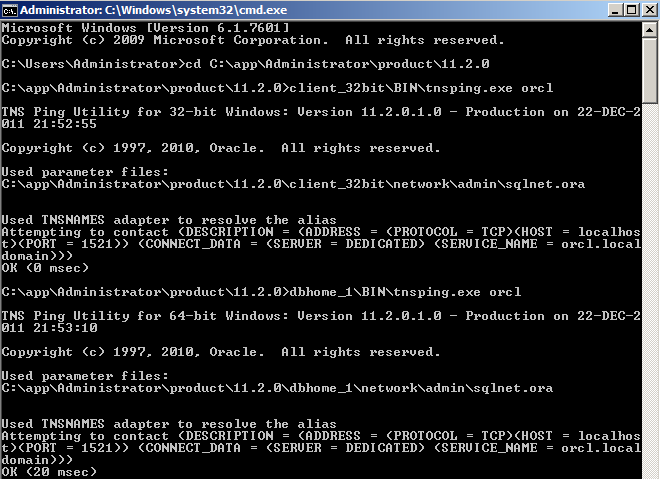 I was able to install both in same hope as you show, but when I type c:\app\csherid\product\11.2.0\client_32bit\network\admin\sqlnet.ora – it just opens the sqlnet.ora file in notpad, it does use tnsnames to resolve any alias. when I type; “C;\app\csherid\product\11.2.0\client_32bit\BIN\tnsping.exe orcl” I get TNS-03505: Failed to resolve name.